PopCap apparently passed up guaranteed cash to go for EA's possibly more lucrative offer. 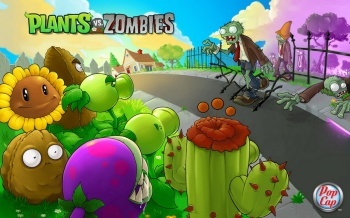 It wasn't just EA that was interested in picking up Plants vs. Zombies creator PopCap. According to insider sources, social gaming giant Zynga was also rather keen to nab the developer, and offered to pay a billion dollars in cash. Zynga apparently would have financed the acquisition with capital secured from Goldman Sachs, one of the leading underwriters of Zynga's upcoming IPO - or initial public offering - where it would start selling shares in the company. Obviously, PopCap turned down the deal, going with EA's offer of $650 million in cash $100 million in EA stock, and potentially another $550 million in bonuses, based on PopCap's ability to make money - something it's not really had much of a problem with in the past. EA has seemingly moved to head off concerns that it would in some way spoil PopCap, going as far as to call it the Pixar of the casual games market. It would have been interesting to see what would have happened to PopCap had it accepted Zynga's offer instead. Zynga has been very successful since it was founded in 2007, but that success has come amidst criticism over a lack of innovation and of copying other games. Would Zynga, undoubtedly aware of its own reputation, have made the same point that EA has, or would it have just turned PopCap into just another office? The former seems a lot more likely; the PopCap brand has plenty of cachet. Of course, the whole thing is really just academic now anyway.